the new Standing Committee in 2007 The Communist Party elite is made up of high-level officials, graduates of the party school, princelings (See Below), and friends and employees of the party powerful. 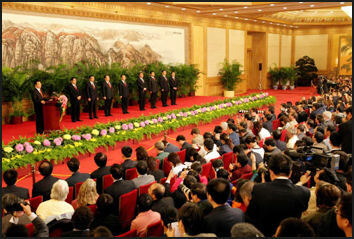 According to the Economist, "Communist Party officials function as China's ruling class. They are a self-selected group accountable to nobody. They oversee government and industry, courts and parliaments...elections are allowed for 'people's congresses'’so long as the party does not object to the contestants...A party committee keeps watch within every institution of government at every level. The system was copied from the Communist Party of the Soviet Union, but expanded in translation." Senior cadres remain overwhelmingly male, but there is now a compulsory retirement age and even (very low) quotas for women. In the 1990s and many senior members of the Communist party were in their seventies and eighties and often had to be nudged by their bodyguards to stay awake during meetings. Many were trained in the Soviet Union. Over time, hard liners and old timers have become a smaller and smaller minority. These days the Communist Party seems to be run by colorless bureaucrats of which Hu Jintao is the best example. Most the highest ranking officials in the Communist Party live in Zhongnanhai, a compound built between the 10th and 13th centuries as an imperial playground and now acts as sort of modern Forbidden City. Mao Zedong, Zhou Enlai and Deng Xiaoping all lived here and the main offices for the Central Committee and the Politburo are all here too. See Cities, Places. Journalists were shown simple bedrooms with computers, televisions and a small selection of books including the collected works of Mao Zedong. Despite the heavy stress on communist theory, students also study how other governments handle issues. The Eurozone crisis was added to the curriculum. Beidaihe is no longer the summer capital of China's political intrigue. The once heavily guarded beaches are occupied by Russian tourists and the media no longer pays much attention to what is going there. Its status as a top leadership retreat has been downgraded by party chief Hu Jintao, who has promoted a more egalitarian approach and wants to nurture the party's populist image. Economic policy for the coming year is often decided at the planing meeting of top Communist Party and Cabinet officials held in December. The agenda for the meeting is often worked out by the Cabinet’s National Development and Reform Commission. Party membership has traditionally been very selective. These day many urban people see few advantages with joining but in rural areas party members are often still regaled as the elite and membership can protect individual interests or provide opportunities that otherwise would be impossible. "Princelings" (taiza or taishito ) are children or other relatives of Chinese leaders and high-ranking officials who have prospered through their connections. Depending on how you define a high ranking official, there are anywhere from 5,000 to 100,000 princelings in China and they range in age from recent Peking University graduates to former Prime Minister Li Peng, the son of revolutionary leader who was adopted by Mao. Describing an evening with a princeling in Quingdao in the mid 1990s, one writer in the Lonely Planet Guide to China wrote: "he shuffled me round to a few dreary tour spots, offered me a place to stay for the night and took me to dinner with his girlfriend. He was, I guess trying to impress her with his broken English---he certainly impressed her with the price of the meal. I stayed the night in his spacious apartment, finding out how cadre's sons live---high! They have enough money, or access to it, to create a generation gap between themselves and their parents." Children of Jiang Zemin, Zhu Rongli and Li Peng all became princelings. Jiang’s son, Jiang Mianheng, was vice president of the Academy of Sciences and an important player in Shanghai’s telecom and semiconductor industries. Zhu’s son, Levon Zhu Yunlai, was the head of China International Capital Corp, a company n which Morgan Stanley had a stake. Li Peng’s son Li Xiaoping was the head of Huaneng Power International Inc. and now is vice governor of Shanxi, one of China's major coal-producing provinces. Li Peng’s daughter, Li Xiaolin, was vice president of China Power Investment Corp. and now runs a major subsidy of China Power. Perhaps the greatest princeling of them all is Larry Yung, son of Chinese Vice President Rong Yiren. As general manager of Hong Kong-based conglomerate he has amassed a $2 billion fortune that included thoroughbred race horses, a Hong Kong penthouse, a mansion in Vancouver and an 800-acre estate in Britain. Life has not always been easy for Yung, however. During the Cultural Revolution he spent eight years doing hard labor in a remote area in southwest China. “Red princesses” is a term used to describe the offspring of Communist leaders who are now members of high society. They include Jasmain Li, the granddaughter of Communist Party No.2 Jia Qinglin, who made debute at a debutante ball in Paris attended Princess Diana’s niece and the daughter of casino tycoon Stanley Ho; and Chen, Xiaodan, the granddaughter of Chen Yun, a founding father of Communist China, who came out at ball attended by princesses from Italy and Belgium. Among those who have made a splash in the fashion world are Ye Mingzi, granddaughter of Red Army general, Ye Jiangying, a designer in Paris who attended St. Martins in London and worked with Issey Miyake in Japan; and Wan Baibai, granddaughter of former legislature chairman Wan Li, who is regular at fashion parties and has her own line of jewelry. Among those that are well known in China are “China Power Queen” Li Xiaolin, the only daughter of former Chinese Premier Li Peng; and the “Charity Princess” Deng Zuoyue, the Wellesley-educated granddaughter of Deng Xiaoping, who has hosted balls to raise money for Sichuan earthquake victims and deaf-mute children among other causes. Thousands of onlookers in north-eastern Changchun city quickly surrounded Mr Jiang Xiaozhu, according to local media, and ransacked his car before he was rescued by the police. An online background search for Mr Jiang, nicknamed 'police uniform man' because of what he was wearing, was quickly launched by netizens, whom the Chinese refer to as 'human flesh search engine'. It revealed the 27-year-old to be a son of a local government official. His father is believed to be a county official and his father-in-law belongs to the same county's security forces. Mr Jiang, an employee in a state tobacco firm, is what the Chinese refer derogatorily to as guan er dai, or the offspring of officials. “This is, of course, an isolated incident. But this kind of thing happens a lot, and moreover, it obviously speaks to deeper issues. Unsurprisingly, it spread quickly across the internet, and has been reposted many times already. This posting on 56.com These stories keep getting passed around beyond their news shelf life, I suspect, because they are tapping into an increasingly common feeling of anger and exploitation among those who really are laobaixing. The story may be from December, but the feeling is as widespread today as it was then, probably more so. Are people about to take to the streets and launch a second Communist revolution to overthrow the new bourgeoisie? Absolutely not. But instead of harassing innocent dissidents and their lawyers, China’s leadership would do well to pay more attention to these issues.